Michelle Obama’s American Grown Book & DVD Contest! – June 6, 2012Posted in: SusieQ FitLife Breaking News, SusieQ FitLife Updates! Michelle Obama's Book American Grown SusieQ FitLife Facebook Giveaway! Contest Details & Top 10 Countdown with Michelle Obama as seen on David Letterman! Do you have a beautiful garden bearing vegetables/fruits that you would be proud to show off! For a chance to win Michelle Obama’s brand new book “American Grown” & the official “Arms of a First Lady” workout fitness DVD? There’s no purchase necessary to enter our “FitLife Garden Contest!” on Facebook! Be sure to LIKE US & join our FitLife Family! Three Steps To Enter! Let’s WIN! 1. Post Your Garden Picture on our SusieQ FitLife Facebook wall “between” June, 7th until June, 24th @7pm! 3. Have friends/family “LIKE” & Comment on your photo, directly on our FitLife page to track all votes! The Most Commented Picture WINS on Monday, July, 2nd, 2012 @7pm! Where another special grand prize will be announced & awarded to the winner, on our website & Facebook Page! Be ready to have fun with your new FitLife Family on Facebook! GOOD LUCK! EVERYONE! First Lady Michelle Obama Presents the “Top Ten Fun Facts About Gardening!” on David Letterman! #10: Gardening was invented in 1822 by Albert Gardener. #9: Plant avocado, tomato, onions and cilantro together to grow a guacamole tree. #8: Eggplants were originally cultivated for use as doorstops. #7: In his lifetime, the average American will eat half a radish. #6: The largest zucchini ever grown contained a Starbucks. #4: If you have an actual green thumb, it might be scurvy. #3: Lettuce is 96% water and 4% lettuce. #2: The White House tool shed contains shovels, trowels & Weed Whacker One. 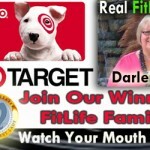 SusieQ FitLife wants you to Watch Your Mouth & Get a FitLife! Watch SusieQ FitLife featured on: Dr. Oz, Good Morning America Health, The Dr. Steve Show & Many More Nationally Syndicated Shows! 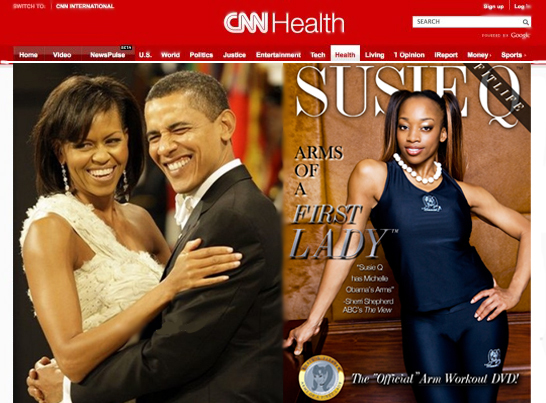 CNN Speaks on SusieQ FitLife Arms of the First Lady DVD!